It is known that major migrations of prehistoric humans across Beringia may have begun around 12.000 years ago. That is why the earliest Native Americans, or Paleo-Indians, according to scientists emerge in scene around 12,000 years ago. It is known the most about western North American Paleo-Indians because archeologists have discovered the richest finds of artifacts. These early paleolithic cultures can be divided into three major groups based on the artifacts analyses on the site. The earliest group, whose artifacts date from 12.000 to 11.000 years ago, left spear or stone arrow heads. 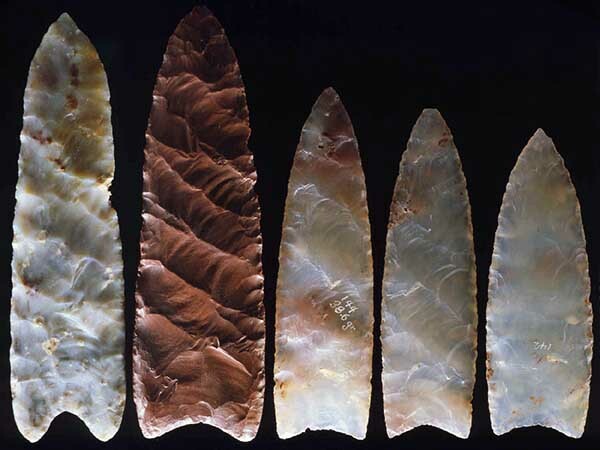 Spear or arrow heads were designed in a manner that called Clovis Fluted, named after the site where they were found in eastern New Mexico. The Clovis people were hunters and they most likely hunted were mammoths. The second group of Native Americans left artifacts dated from 11.000 to 10.000 years ago. These artifacts are characterized by a knife made out of flint. This paleolithic group according to artifacts they made and according to Folsom archeological site in New Mexico where artifacts discovered archeologists named as Folsom people. They weapon design is called Folsom point. Folsom paleolithic people developed they own Folsom culture and they seemed to have largely been hunters as Clovis culture. The next group are characterized by leaf-shaped, unfluted projectile points. This group of paleolithic people in Canada archeologist call Plano culture. People from Plano culture lived about 10.000 to 8.000 years ago. Plano humans also hunted large animals. 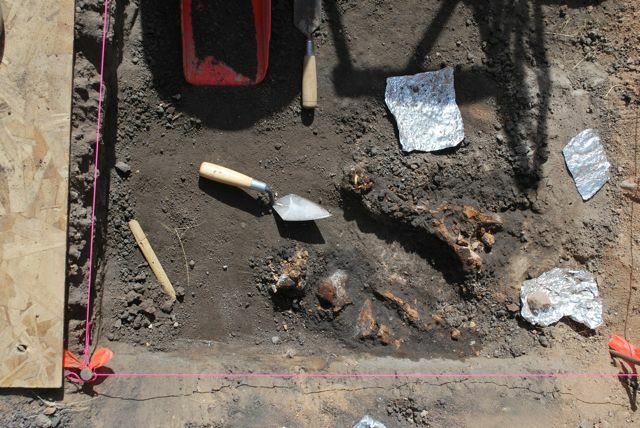 The Clovis, Folsom, and Plano paleolithic cultures represent the earliest American cultures. For no real logical reason archeologists and historians called these people the Paleo-Indians, or Old Indians. 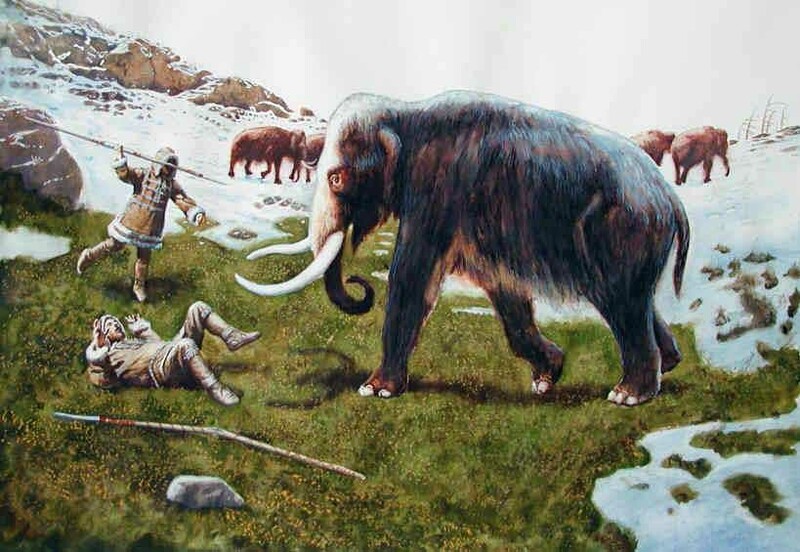 These groups of prehistoric people engaged in a largely centered around large animals such as mammoths and bison. Hunting methods of these paleolithic groups in America involved mass extermination of their prey. Hunting in hordes (small group of people) they usually driven over a “fall” or trapped in a box canyon animals such as Bison or Mammoth and picked off using small spears or darts. Anthropologists separate Paleo-Indians from the Archaic period (also Meso-Indian period) using a dividing line period at around 8.000 years ago. Paleo-Indians economy focused on a hunting large animals and mass exterminations, while the Archaic cultures are characterized by Mesolithic economy focusing selectively on resources seasonally, so that they had a far greater range of subsistence resources than the Paleo-Indians. During Archaic period humans inhabited all parts of the North and South America. Agriculture seems to have begun in the Archaic period about 7,000 years ago in the Mexican Highlands. People began to domesticate indigenous species of local plants. The most important domesticated plants in America were maize, pumpkin squash, amaranth , and beans from the six to third millennium before present. Maize, squash, and beans are the most vital foods in Native America cultures. This products can be adapted to many different climactic zones and, in combination, provide a completely balanced diet if all three are eaten on a regular basis. The Archaic period ended around 2000 BC with new cultural practices in neolithic era such as pottery making and the building of settlements. This transitional period is called the Early Woodland. The Early Woodland period probably begun in the northeastern region of North America and spread very rapidly. Woodland period can be divided into three sub-periods: Early Woodland period (1000–200 BC), Middle Woodland period (200 BC–500 CE) and Late Woodland period (500–1000 CE).